There is no comparison to the uniqueness, quality, and beauty of our lacrosse award presentation plaques. Laxmedals lacrosse award plaques are the perfect choice for presentation to honor on-field excellence and other contributions to your team, event, or the sport of lacrosse. Our trademarked lacrosse award plaques are unmatched in beauty and originality, uniquely capturing the Native American history and modern spirit of the game as only Laxmedals can. Laxmedal lacrosse award plaques are assembled to your exacting choice of color and size. We affix our choice of our unique 3D art medallions to a solid oak wood base, which are handmade by Virginia craftsmen here in the U.S. We then complete the plaque with a full-color printed plate with your logos and wording of your choice. Laxmedals lacrosse award plaques are proudly made in the USA. Note: Plaques are hand made from different stocks of wood. Plaque colors may differ slighly from photos or form piece to piece. Please plan to allow 3-4 weeks for order design and delivery. 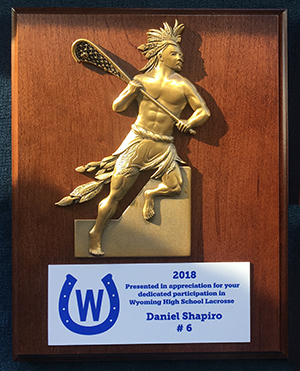 The Heritage of the Game is a Laxmedals tradmarked signature lacrosse award plaque created to honor of the Native American Indian origins of the game of lacrosse. Thia lacrosse plaque features a crafted 6" x 4" x 4mm medallion mounted on a solid oak 8" x 10" wood base. The 6" x 2.5" plate below the medallion is custom printed with logos and text of your choosing. Shown in antique gold with full color printed plate. Below is the plaque in antique silver. Available only in 8" x 10" plaque. The Traditions award plaque is a Laxmedals trademarked signature lacrosse award plaque created to honor of the Native American Indian origins of the game of lacrosse. This lacrosse plaque features a 6" x 4" x 6mm medallion mounted on a solid oak 8" x 10" wood base. The 6" x 2.5" plate below the medallion is custom printed with logos and text of your choosing. Shown in matt gold with texture printed plate. Below is the smaller 7" x 9" plaque in antique gold with 5" x 2" plate. The BOYS MVP lacrosse award plaque was created by Laxmedals to capture the modern vibe of the game of lacrosse. This lacrosse plaque features a 6" medallion mounted on a solid oak 9" x 7" wood base. The 5" x 2" plate below the medallion is custom printed with logos and text of your choosing. Shown in antique brass. The GIRLS MVP lacrosse award plaque was created by Laxmedals to capture the modern vibe of the game of lacrosse. This lacrosse plaque features a 6" medallion mounted on a solid oak 9" x 7" wood base. The 5" x 2" plate below the medallion is custom printed with logos and text of your choosing. Shown in antique brass. The Traditions medallion lacrosse award plaque features a large 3-inch diameter Laxmedals trademarked medallion mounted on a solid oak 8" x 6" wood plaque. The 5" x 2" plate is included and with custom printing for your logos and text. Sample shown is antique gold with custom printed plate. Available only in the 8" x 6" plaque size. The Mens Classic I medallion lacrosse award plaque features a large 3-inch diameter Laxmedals trademarked medallion mounted on a solid oak 8" x 6" wood plaque. The 5" x 2" plate is included and with custom printing for your logos and text. Sample shown is antique gold with custom printed plate. Coming in 2019! A new presentation plaque featuring all new Laxmedals.com 3d art. Sure to be an exciting new presentation piece for the lacrosse champion.